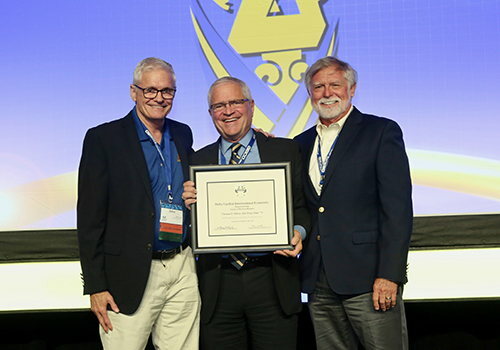 Aug. 2, 2018 - During Delta Upsilon's 2018 Leadership Institute in Scottsdale, Arizona, the Fraternity presented six Awards of Merit to deserving DU alumni. 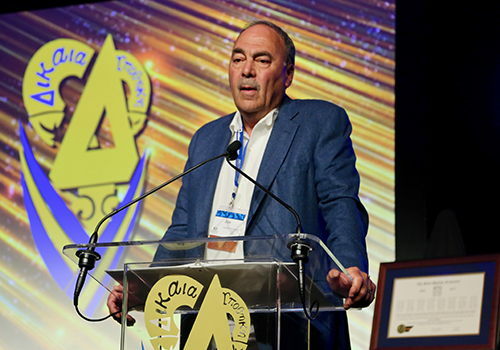 These awards are presented to brothers who excel in their careers and are named for the Fraternity's historical tie to the Founders' description: "The only superiority that we acknowledge is the superiority of merit." Divided into 10 different categories, each award is also named in honor of a DU brother who has excelled in that particular field. The Award of Merit categories are: Sloan-Kettering Award of Merit in Business, James Conant Award of Merit in Education, Edgar Bergen Award of Merit in Entertainment, Charles Evans Hughes Award of Merit in Justice, Stephen Crane Award of Merit in Literature, Lester Pearson Award of Merit in Human Service, Linus Pauling Award of Merit in Science, James Garfield Award of Merit in Public Service, Holtz-Munson Award of Merit in Sports, Craig S. Sowell Award of Merit in History. 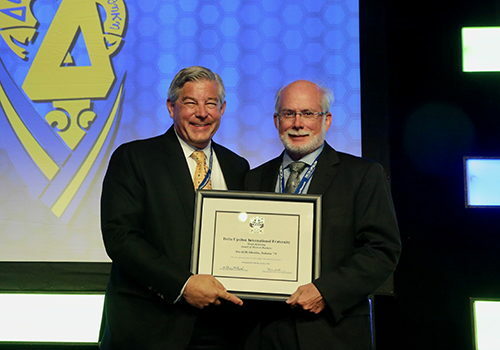 At LI 2018, four Sloan-Kettering Awards of Merit in Business were presented, as well as one Linus Pauling Award of Merit in Science and one Charles Evans Hughes Award of Merit in Justice. The Sloan-Kettering Award of Merit in Business is named for Alfred P. Sloan, Technology 1895, and Charles Kettering, Ohio State 1904, who were long-time executives with General Motors and founders the the Sloan-Kettering Institute. The Linus Pauling Award of Merit in Science is named for Brother Linus Pauling, Oregon State 1922, who is the only person to be the sole recipient of two Nobel Prizes. These awards were in Chemistry in 1954 and Peace in 1962. The Charles Evans Hughes Award of Merit in Justice is named for Brother Charles Evans Hughes, Brown 1881. Brother Hughes served as governor of New York, U.S Secretary of State and an Associate Justice in the U.S. Supreme Court. Throughout his life, Hughes used justice his foundation to help his fellow man. Tom Darcy has more than 45 years of experience in finance and accounting. He is a director, co-founder and retired Executive Vice President and Chief Financial Officer of Tocagen Inc., a biopharmaceutical company pursuing the discovery, development and commercialization of novel products for the treatment of cancer. 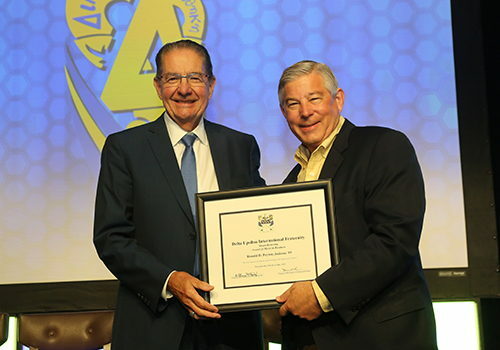 Tom also serves as a Director and Chairman of the audit committee of Lytx, Inc, a private technology company that is the global leader in video telematics and safety services for the commercial and public transportation sectors. 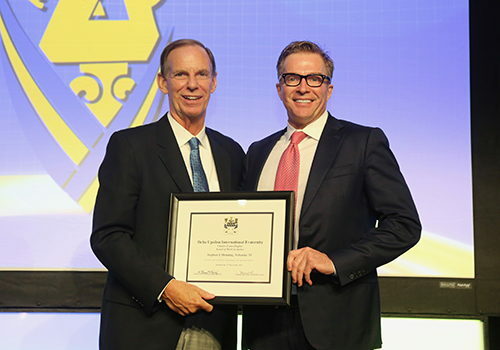 Brother Darcy’s community activities include serving on the SDSU College of Business Advisory Board. He has also served on the boards for the San Diego County YMCA, the Economic Development Corporation of San Diego, BIOCOM San Diego, the San Diego Space and Science Foundation, and more. Tom is a past officer for both the Delta Upsilon San Diego State Chapter Alumni Association and the Del Mar Little League. David Diesslin founded Diesslin & Associates, Inc. in 1980 to provide fee-only financial planning and wealth management services to individuals, corporations, closely held businesses, foundations and nonprofit organizations. He currently serves as Board Chairman of Diesslin Group, Inc.
Worth Magazine, Medical Economics, Money Magazine and “D” Magazine. He is endorsed by the Consumers’ Research Council of America as one of America’s Top Financial Planners. He has also been featured/quoted in major news publications, including The Wall Street Journal, New York Times and the Dallas Morning News. David graduated from Indiana University, received his M.B.A. degree from the University of Dallas, and earned his Certified Financial Planner (CFP) designation from the College for Financial Planning. An active member of numerous on corporate boards and philanthropic organizations, David a former Board Chairman for the CFP Board of Standards. 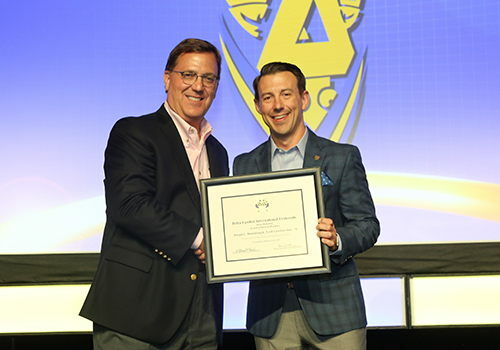 He is also a founding member, and Past Chairman and President, of the National Association of Personal Financial Advisors (NAPFA). In addition to this service, David serves as Chairman of The Deena Jo Heide-Diesslin Foundation, a private charitable organization named in memory of his late wife, and is very involved in the foundation’s work. Stephen Henning is a co-founder of Wood, Smith, Henning & Berman LLP, an AmLaw 200 law firm with 22 offices throughout the United States. Steve is a skilled litigator, nationally recognized for results in complex construction, real estate, business and toxic tort litigation. He regularly represents Fortune 500 companies and preeminent members of the business community, including some of the nation’s largest residential and commercial public and private owners, homebuilders, developers, investors, contractors and lenders. Additionally, Steve has a thriving practice focused on public entities, handling all facets of litigation and risk management pertaining to construction and toxic tort issues. Steve received his undergraduate and law degrees from the University of Nebraska. Ron Peyton is Executive Chairman of Callan, one of the largest independently-owned investment consulting firms, as well as chairman of the Callan Board of Directors. Ron provides firm-wide oversight by conferring with associates and clients to improve communications, process and service quality. He regularly meets with clients and senior industry professionals and engages in industry and community events through speaking and service opportunities. Outside of Callan, Ron serves on the board of the United Way Bay Area and was President of Filoli, a National Historic Trust Property. He also served on the CFA Institute’s Performance Presentation Standards Implementation Committee (now known as the Global Investment Performance Standards, or GIPS) and was Chairman of the Asset Manager Code of Conduct Advisory Committee. Ron has also worked with Marathon Oil Company’s pension investments and served as an officer in the U.S. Army Reserve. Ron earned an M.B.A. in finance and a B.S. in accounting at Indiana University, where he was president of the Indiana DU chapter his junior and senior year. Joe Schoendorf has been active in the technology industry for four decades. He has been a partner at Accel since 1988, a venture capital firm that helps companies start and grow their business. Accel has worked with companies including Facebook, Slack, Venmo, Spotify and more. In addition to his work for Accel, Joe also currently serves as a strategic partner of the World Economic Forum and is a sought after speaker and collaborator. One of his current projects includes a “Tech for Good” project with dozens of other tech CEOs and French President Emmanuel Macron. Prior to joining Accel, Joe’s past positions include serving as the Vice President of Marketing for Apple Computer; Executive Vice President for Worldwide Sales and Marketing at Ungermann-Bass; CEO of Industrial Networking; and an 18-year career with Hewlett Packard. Joe is a graduate of Purdue University and has served on the Dean’s Advisory Council at Purdue’s Krannert School of Business. Joseph Raudabaugh enjoyed a 34-year career of consulting and leadership experiences with A.T. Kearney. Throughout his career, he has led various service practices and geographic units, including serving as the managing director of the firm’s Japan unit and founder and president of A.T. Kearney’s Procurement and Analytic Solutions business. He has served more than 100 clients with an emphasis on strategic, operations and supply management issues. Brother Raudabaugh also founded and developed the A.T. Kearney Student Lab Program, which, along with more than 250 client organizations, has brought experiential learning to more than 3,000 students across most of the top 15 global business schools. In 2013, he began leading the Innovative A.T. Kearney initiative to inspire and nurture enhanced innovation across the firm. Joe is the author of numerous articles and is a co-author of “The Purchasing Chessboard” (Springer, 2008). In 2012, he was named to Consulting Magazine’s Top 25 Consultants list. Joe also serves on the board of the Glacier National Park Conservancy. Prior to joining A.T. Kearney, Joe spent five years in the chemical industry with Air Products & Chemicals in product management, business development, and corporate planning roles.